Uche Uwahemu—trained in law and business, and shaped by more than a decade of nonprofit work—speaks earnestly about the future of Richmond. At 41, he is the youngest of Richmond’s four mayoral candidates. Wearing a gray pinstripe suit with a lavender tie, Uwahemu sat in Café Pascal recently and shared his thoughts on solving the toughest issues facing the city. Part of his plan for doing this involves a serious investment in the port of Richmond. He said many people in the Bay Area don’t even realize that Richmond has a port. Uwahemu is currently CEO of Cal Bay Consulting Group LLC, which helps businesses and non-profits across the country with strategic planning. “In business we ask: What are your strengths? What are your core competencies, right? What are your resources? We have a port here that is completely underutilized.” Uwahemu said making this key resource in Richmond a global port could create about 15,000 jobs. Using the analogy of the 49ers football team, Uwahemu said for years they had potential, but it wasn’t until Jim Harbaugh took over as head coach that the team started to win. Uwahemu smiled, a dimple materializing on his right cheek. Uwahemu feels he is the Harbaugh to help Richmond realize its potential. But in order to become a winner in the global marketplace, Richmond needs to create a skilled workforce. While he supports a minimum wage raise for workers, the candidate said the city also needs to train them. “We don’t have the workforce to compete with the jobs even if you bring jobs here,” he said. He wants to bring a technical college to Richmond, which he said would build up both the workforce and job opportunities for local residents. Opportunity is a word that is never far from Uwahemu’s mind. Born in Nigeria, he moved to Washington, D.C., with his family when he was 15. He said he came to this country believing it was the land of opportunity—where you can succeed through hard work. In 2002, Uwahemu made Richmond his home. After attending law school and getting his MBA, he married and now has two young sons. Personally, he said the most important thing in his life is treating other people right. By nonsense, Uwahemu is referring to the waste and mismanagement that he sees in the city’s current administration. He said the negative climate of the city council—which has been criticized for drama and infighting—has led businesses to question whether Richmond is really ready for change. No conversation about Richmond’s future is complete without a discussion of Chevron Corporation. Since a fire at the refinery in 2012, which sent 15,000 people to hospital, the city’s complicated relationship with the oil giant has become even more strained. “They are our tenant,” Uwahemu said. “I know folks aren’t used to hearing that. We want to create a tenant-landlord relationship.” He said he intends to work with Chevron to mitigate both their risk and the risk they pose to the community. He said he doesn’t want to look at Chevron as an enemy of this community, but as a partner. “I’ve never approached any business person or business, and said, ‘Let me teach you how you can mitigate your risk,’ and they say, ‘No,’” he said. Uwahemu said he admires Mayor Gayle McLaughlin for trying to help residents in Richmond keep their homes through the radical approach of using power of eminent domain to seize underwater mortgages. The decade that Uwahemu spent working with non-profits—working with homeless individuals, people with mental disabilities and veterans—helped shape his life. “You understand what the root cause of poverty is,” he said. But, Uwahemu acknowledged many of his ideas won’t be easy to implement. “This is not easy stuff, let me tell you. It is not easy stuff, but we have to have leaders that are willing to do the hard work, that have the energy to engage folks and say, ‘Yeah, this is a 24-hour-a-day job,’” Uwahemu said. Though Uwahemu has lived in Richmond for 12 years and has served on a number of boards including Contra Costa County’s Economic Opportunity Board, he faces a challenge of being –unknown to many local residents. Even as he works to change this, Uwahemu feels it may also work to his advantage. “Bottom-line, I think this community is looking for a new direction,” he said. The current political discussion has to move away from character assassination, name calling and a factious “party spirit.” Neither the “greens” nor the traditional pols seem to understand nor have the skills to negotiate the new global economic reality and the advantage we have with our extensive attractive port. I think that this candidates’ willingness to set forth a realistic, long-range economic agenda is a breath of fresh air. 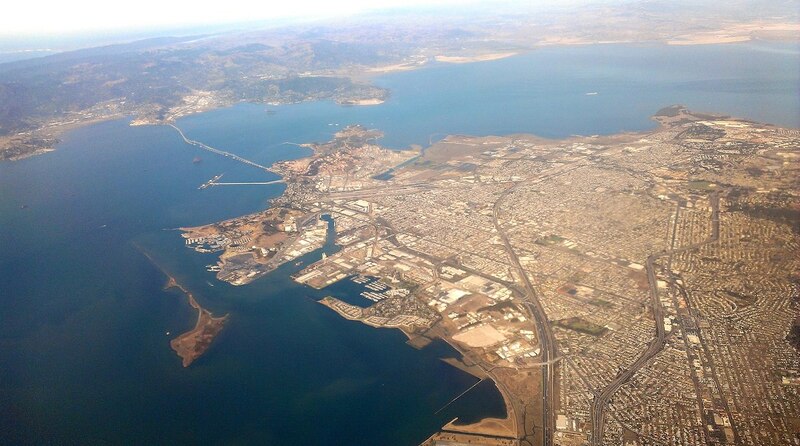 No other East Bay community has the “peninsula advantage” of two distinct bays surrounding it, albeit highly underutilized and undeveloped. Hey, there, somebody running for Mayor that doesn’t sound like a Fossil? Sounds promising, particularly if he could stand the hedgemony of the current council, most of whom ought to be incarcerated in a padded room, or retired to a Geezer Ward.